One of the primary uses of PVD coating machinery is in the medical industry, where the process is used widely on a variety of devices used by patients and doctors. One of the more common uses is eyeglasses, where a thin film of anti-glare chemicals makes it easier for patients to see as they are out and about. That’s just one application in a host of uses. Medical device coatings bring important benefits to patients, including lifesaving benefits that reduce patient mortality rates from common infections. One of the largest problems a modern hospital has yet to overcome is cross contamination, and the risk of infection. No matter how advanced we seem to get, it’s difficult to stop infections from spreading. One of the most common methods is through a catheter. These devices are normally sterile but may pick up infections through exposure to the air. One of the methods manufacturers employ to stop these infections from spreading is thin film evaporation of anti-microbial chemicals. These chemicals coat the tubing of the catheter and resist bacterial infections, even when the device stays in the patient’s body. One of the biggest challenges a patient faces with these devices is the level of comfort provided. A medical device isn’t normally meant to relax a patient, but it’s important they not interfere with the patient’s well-being. If the patient can feel the device, or the device is causing pain or discomfort, then any healing and recovery is that much harder. New coatings are designed to make devices easily slip into the body, without getting caught on flesh. That makes it easier to remove a device from a patient’s body, reducing the risk of re-opening a wound or harming the recovery process. We don’t think of durability as often when it comes to catheters, but they make a difference when you’re talking about joint replacements. Metalizing plastic has made a significant difference in the cost of devices, and how long they can last inside the body. These new devices are more durable than previous generations, and move easier with the patient. That lack of resistance goes a long way in restoring movement to joints that otherwise lacked it. Coatings not only protect patients, they lower manufacturing costs and reduce wasted materials. As a result, patients get the devices they need to help them recover for less. Devices are also built to last, so patients don’t need to waste money or risk their lives on repetitive surgeries replacing old devices. 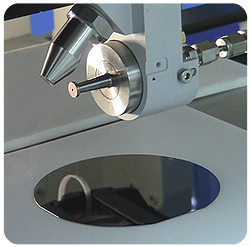 Denton Vacuum makes PECVD coating devices for the medical and advanced manufacturing industries. For more information on vacuum metallization or chemical vapor deposition, visit Denton Vacuum, LLC.